After receiving reports of forced disappearance at the hands of the military dictatorship in Argentina in the late 1970-80s, the Catholic Church and Pope Francis himself are on a mission to open up the Vatican archives, to make disappearance cases public. The Vatican, a key player in the Catholic country during those years, regularly received complaints from relatives of the victims, who notified the Holy See of their mysterious disappearances. Over three decades later, the Catholic Church has finally got around to dealing with multiple disappearance cases during the so-called Dirty War, which lasted in Argentina from 1976-1983 during the military junta. The seven-year campaign by the Argentine government was aimed at getting rid of suspected dissidents that were opponents of the government, principally the Peronists, as well as innocent people who "disappeared" in the middle of the night. They were allegedly taken to secret government facilities where they were reportedly tortured and in many cases killed. These dissidents, believed to number between 12,000 - 30,000, became known as "los desaparecidos" or "the disappeared." Now Pope Francis, an Argentine himself, is trying to make the government records public in order to shed light on the fate of those that suffered at the hands of the military regime. 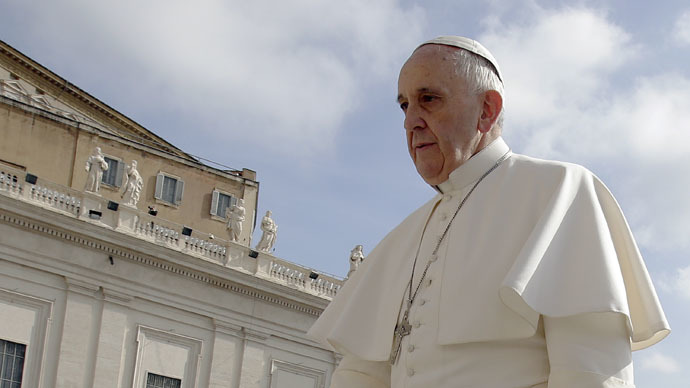 The request to grant access to Vatican archives dealing with cases of Argentine disappearances was accepted by the pontiff after holding a meeting last week with Ángela Boitano, president of the Group of Families of those Arrested and Disappeared for Political Motives. “The pope’s wish is this, that something be done, and in order for that to happen, he has given the task to the Secretariat of State and it has started working on the issue of declassifying Vatican records concerning the Argentinean dictatorship,” Boitano was cited as saying by El Pais. Boitano hopes the pope will also order an investigation into the roll the Argentinian Catholic Church played during the military junta era. “He promised us he would take care of the matter. The church had the exact data on the disappearances and the Vatican is looking [into] it,” Boitano said. “A large segment of the Church, not exactly Bergoglio, was complicit in the dictatorship,” Graciela Lois, a founding member of the relatives’ group calling on the pontiff to make the records available, told the Argentinean publication. Argentinians hope that making the records public will heal many wounds in society and restore people's faith in the Church. “Self-criticism is a necessity. We believe that it will be done. And we hope that opening up the archives will help us know the truth. Some things have already been opened, and if there is a petition from a judge, they are willing. But the most important thing is that now everything will be available. They have told us that they are working on it,” Lois said. Jorge Rafael Videla, a senior commander in the Argentine Army and dictator of Argentina from 1976 to 1981, was sentenced to life in prison in 2010 for crimes against humanity committed during his murderous Dirty War against left-wing dissidents. Videla died in prison on May 17, 2013.